When talking of SSH clients, the first name that pops up in our mind is Putty which is the most popular SSH clients for Windows. While it helps users to connect to a computer remotely through a secure channel, it’s also highly preferred by Network Engineers or server admins to configure their SSH activated services. Additionally, an SSH client is used to access headless systems that includes all kinds of TV boxes, single-board PCs, and other machines that are not facilitated with a local terminal (for example, a mouse, keyboard, or the monitor). Remote access was done via TTY (teletypewriters) in the earlier times that were just an improved version of the electric typewriters. These helped connect to remote systems over a serial connection. Since this was a slower connection, it gave rise to the creation of video terminal using the same concept as the teletypewriters. Then came the Telenet client that were used by many users for years, followed by the evolution of the SSH client that featured SCP (Secure Copy) as a well-known file transfer technique. Putty.exec has been around for years now and has earned immense popularity in the course of time. But, there are many able alternatives for Putty that offer abundance of features and versatility. We have made finding the best Putty alternative easier for you, by creating a comprehensive list of SSH clients. The entire aim of the SuperPuTTY is to improve the efficiency of PuTTY SSH by helping users open it in several tabs at a time. So, if the users want to manage different sessions of PuTTY with the help of a single, detailed user interface, it can be done easily. The client features a responsive user interface with multiple tabs for PuTTY. Support for different kinds of connections and protocols, like Telnet, KiTTY, SSH, etc., are among its major features. It also offers different types of general settings for customization, while users can also configure LDISC (line discipline) and remote-operated printing. Moreover, keyboard controls, alerts, and alarms can be pre-set by users, in addition to changing the way the terminal screen behaves. Importing and exporting sessions, saving designs to be used later, ability to connect the system to many computers, or controlling all the workstations using the user interface, SuperPutty is a robust alternative to PuTTY. Managing credentials that covers the private keys allowing users to log in automatically. Support for multiple sessions using a tabbed user interface. Quick and easy access to the highly used sessions. Ability to connect automatically when disconnected from the server. Graphical file transfers using SFTP. Support for after connection scripts. Facility to integrate with Windows lookup. Can be operated from external storage hardware without messing with the Windows registries or adding any extra files on the system. This user-friendly and simple software also offers the users with a sample connection link that they can use to generate their own sessions. Users are also allowed to use the “Settings” option to change the settings for tags, logs, sessions, scripts, and credentials. KiTTY is a free and open source software that’s split version of PuTTY. It comes equipped with multiple add-ons making it a perfect replacement for the original client. KiTTY is designed specifically for the Windows platform and acquires all the features from the original PuTTY client. This compact software is designed in a manner that allows the users to use the Telnet protocol to be able to connect a remote computer. Users can connect to workstation using the IP address and the type of the connection. It also allows the users to configure several connections at a time and store the parameters so that the connection can be quickly restored later. KiTTY uses SOCKS or HTTP proxy server for creating a secure connection. Additionally, it sports a user-friendly interface that offers fast access to all the variables for the running session, connection, and the terminal windows. Users can also customize the terminal window by defining the color, behaviour, and name. From the option to operate in the background for quick session start, or supporting hyperlinks, there are many more such features to look out for. PuTTY Tray works as a strong alternative to the actual PuTTY client with some added features apart from the ones already inherited from the original client. It’s a portable tool that eliminates the requirement of any installation, while offering its advantages through the features. All one must do is to double-click the executable file and the application window is launched. This helps in leaving no signs of it on the Windows platform and can even be carried on an external drive (USB, pen drive) to be used on other systems. Best of all, as a split version, PuTTY Tray offers more connection types than the original, while adding CygTerm and ADB to the original client. As a bonus, it also supports URL hyperlinking. While using an SSH client to link to a remote server, a visual SFTP browser automatically gets generated so that it can edit the user’s remote files directly. Remote applications get displayed on the user’s Windows desktop uniformly with the help of integrated X server. However, the free version has its set of limitations that includes max 12 concurrent sessions, max 2 SSH tunnels allowed to establish, maximum 4 macros, and tie limit fixed to 360 seconds (6 minutes) for Cron, NFS, and TFTP. 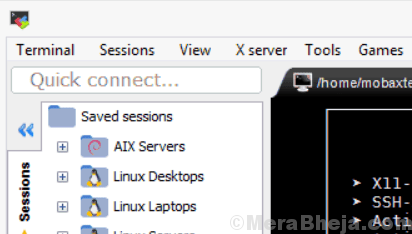 mRemoteNG is a free and open source forked client of mRemote with a tabbed interface, that allows remote connections. This client mixes up several protocols in one single software. It’s also known to add bug fixes and provide updates with new features to mRemote. Availability of SSH, Telnet, HTTP/HTTPS, and raw socket connections. XShell is another name among the best alternatives for PuTTY that supports different protocols, like SSH1, SSH2, SFTP, TELNET, SERIAL, and RLOGIN. While this dynamic terminal emulator is known for its competitive performance, it also includes a perfect mix of features and benefits compared to other SSH clients. Some of the features that are especially suitable for enterprise users are, tabbed interface, powerful port forwarding, highlight sets, custom key mapping, Scripting in VB/JS/Python, and so on. Moreover, it allows you to quickly access to all what is required to manage a session. With support for horizontal scroll bars, users can get much cleaner view of the easy tracking of the remote servers. Users can also create Master Password adding an extra layer of security to the session file encryption. SmarTTY is another SSH client that’s available for free and is multi-tabbed. It allows copying files and directories with SCP randomly and editing arranged files. The new version features a re-designed main window that looks extremely appealing in a latest high-resolution display. It also features the new smart terminal mode that boosts the productivity of completed work to a high degree on SSH client by broadening the normal terminal experience using few handy visual elements. A new smart Tab mode is added to the upgraded version that solves the text editing experience in both Linux and Windows. On opening a Smart Tab, the client will automatically catch whether the user is editing a command line, or controlling a command via SSH. The Smart Tabs also offer immediate suggestion popups with files and command names, just like the modern code editors. SmartTTY also understands the directory and the factors of its results thereby, saving you a lot of time to interpret. It replaces the string that appears like a fully eligible Linux path with a clickable link. The client also reveals the list of running directories and files since it monitors the current directory of each tab. The list looks a lot like the GUI of the Windows Explorer. Bitvise SSH client is designed to offer a protected remote access for Windows and workstations. The key feature of the software they claim, is security, in comparison to the Telnet and FTP servers, and so, the Bitvise offers encrypted data during the transmission. This helps in keeping your credentials (mainly passwords) safe from malicious people. They cannot even view the user files that users transfer when they access their systems over SSH. The Bitvise server is perfect for administering Windows servers remotely, for transferring files securely using SFTP and SCP, for professional users who want to access their work systems from home or home systems from work, and also for a larger spectrum for higher level tasks for instance, offering protection for other software through SSH tunnelling. For users looking for a free SSH client that’s also available for paid upgrades, their search may just end here with Dameware SSH client. This terminal emulator allows several Telnet and SSH connections form a single user-friendly console. According to the websites, it’s a security oriented remote support software that’s easy to use, highly rated, and fits in your budget. Some of its major features include, support for multiple platform including Windows, offers remote session tools, offering top level security with multi-factor verification, active directory management, and in-built help desk. Managing several sessions at once from single console with tabbed interface, saving the mostly used sessions inside the Windows file system, allowing access to several sets of stored credentials letting users log in easily to different devices, and connecting systems and devices using different protocols like, SSH1, SSH2, and telnet are some of the major functionalities to look for. ExtraPuTTy is again another split version of the original PuTTY client that also features some of its own add-ons and advantages making it easier to use. Among its major features are, DLL frontend, shortcuts for pre-set commands, keyboard shortcuts for pre-set commands, automatic arrangement of commands, automatic login script, facility to hyperlink URLs, no installation required, modifying PuTTY settings or conduct, session manager for PuTTy, timestamps in log or terminal, facility to generate reports, ftploader tools, and so on. Additionally, while menu bar, status bar, configuration window, serial port settings, and launch in full screen mode are some of the graphical features, its file transfer features include integration with FTP client, TFTP client, SCP integration, SFTP, YModem, XModem, and ZModem. Talking of its technical features, scripting session with Iua, TestStand steps, and drag and drop are some of the functionalities worth mentioning. Terminals is a free and open source multi-tabbed SSH client that comes equipped with several features and is definitely among the best SSH clients in the list. This terminal service client features a multi-tabbed interface, opens up in full screen mode, facility to change between full screen mode, allows saving favorites, offers networking utilities like Ping, Shares, Wake on lan, DNS tools, etc., shows connections history, captures screenshots, allows to launch custom application from Terminal Windows, and support for different protocols such as, Telnet, SSH, Windows remote desktop, VNC, and more. The above list is a detailed view of the best SSH clients that’s a perfect mix of paid and free PuTTY alternatives. These are specifically for those looking for home or personal use, and if you are looking for an SSH client for enterprise use, you may need to find more options. So, make a pick from the list and get going with your remote access.